Sumo is a sports that everyone can enjoy. The rule is very simple. This player will lose a match if step out from dohyo, touch of any part of body outside dohyo, down into dohyo, touch of any part of body but sole to surface of dohyo and make a faul. Therer are professional sumo also, so called ozumo(grand sumo). The Japan Sumo Association(Nihon Sumo Kyokai), a public corporate, is the organization that promotes sumo's development as a mission. They are regularly holding ozumo (professional sumo wrestling tournament)6 times throughout a year. (January,March,May,July,September,November).Sumo is fought by a tournament of 15 consecutive days. Two sumo wrestlers so-called Rikishi　wearing mawashi(sumo belt)only ,face each other at both shikiri （the mark lined in white )of 70 cm in between at the center of dohyo(solid sand mound of round shape) and rise to their feet in the same breath within each limited time. and 2 minutes for makushita and other(more lower ranked) . In ozumo, there is no classification in bout by weight. which is characteristically different from western wrestling. butit is possible for maximum 5 other referees of ex-sumo wrestler watching the match around dohyo to join the judgment. There are 82 tricks and 5 non tricks and 8 fouls in sumo . Immediately after match is over, both wrestlers ,regardless of bout outcome, have to make a standing salutation with head down, respecting opponent for their earnest fight politely. In the meantime, there are numerous amateur sumo organizations which underpin ozumo. It is possible for amateur to join ozumo. According to his outcome during his career of amateur age, he could be starting from grade 10th to 15th of makushita. On the other hand, ex-sumo wrestler is often coaching amateur . As such, they are cooperating each other. We have, for example, Japan Sumo Confederation,　Student Sumo Confederation of National& Public University, Wanpaku(impish boy)SumoAssociation, and so on. There are also a lot of sumo contest and/or championship of amateur prevailing nationally and internationally. Amateur sumo is following most of ozumo rule but sometimes they make an exceptional rule to have the match by age or weight as follows; By Age = Classification of elementary, middle and high school and university and open By Weight = Less Than 65 kg, LT75kg, LT85kg, LT100kg, LT115kg LT135kg and Free By Trick = Same 82 tricks and 5 non tricks as ozumo, but such dangerous acts as sabaori, (give mawash i a jerk with downward strength ),kubinage(neck throw),and sorinage (backward throw)are prohibited. Gyoji =One main referee and minimum one sub referee Wears Allowed = Under-pants are possible for elementary and middle school boys Sumo originally meant to wrestle strength with others, so that the original Chinese letter for sumo was expressed as “角力”which derives from “角てい”during Shin dynasty. Even today, we often say角界(kaku kai)for sumo circle. There are similar sports as sumo available in other parts of world;Bufu in Mongol , Shirumu in Korea and wrestling in Turkey and other parts of Eurasia continent. A mural painting of caves alongside the Nile River of 2,500 years ago depicts men’s bout of wresting. So, it may be said that bout is an intuitive expression of healthy human beings to show his strength It also symbolizes each local character. And some had developed to current wrestling and other to sumo. Today, we have seen an influx of hopeful youngsters from overseas countries into ozumo to compete with native Japanese sumo wrestlers. Sumo was originated for male sports but nowadays, sumo for female called “New Sumo ”is also available. For this, an organization called Japan New Sumo Confederation exists. Sumo wrestler shall not be allowed to wear any but mawashi, but in case that he is injured , he is allowed to wear bandage, supporter, and white socks. This means that any seemingly offensive wears are not allowed to use in sumo bout. Sumo was originally a part of Shinto (Japanese indigenous religion)events. Most shrines held sumo contest when a festive was held there. It was called as a dedicated sumo to shrine. Ozumo sometimes hold a touring sumo at Ise Shrine and Yasukuni Shrine. They also hold a dedicated sumo at Meiji Shrine when a new year comes and new Yokozuna( Champion sumo wrestler) inaugurates. When wrestlers are displayed in the ring, they clap their hands and Yokozuna tightens his tsuna(rope)mawashi. These derive from Shime-Nawa of Shinto. And Shiko(stamping) is an important practice of sumo trainings and at the same time, it means to drive evil- spirits away, stamping them down to the earth. You also see that they clap their hands and extend their arms to both ends and turn their palm down to the ground immediately after wrestlers are displayed in the ring. This shows they have no weapons in their hands and fight with unarmed. And other Shinto related sumo events are such as that when dohyo-biraki(commencement of practice at dohyo) of each sumo-beya(training room run by a factional boss of ex-sumo wrestlers)starts or on the very day before a regular sumo tournament begins, dohyo-matsuri is held for praying no　accident at dohyo during the tournament. Gyoji, acting as Shinto priest, recites Shinto prayer and offers sacred wine, chestnut, washed rice, surume( dried squid), salt, thatch seed and tangle to four corners of dohyo by which he could purify dohyo. As such, dohyo deems to be a sacred place. Until Meiji era started, no female could be permitted to see sumo. Even today, it is somehow controversial to have a female at dohyo. As a rare Shinto event, there are “Naki-Sumo”(Weeping Sumo) and “ Karasu-Sumo”(Raven Sumo). The former is to pray for infants steady growth . Many shrines and temples throughout this country have long been succeeding this tradion, while the latter storied that Kamotake-Tsunuminomikoto, the grand father of the founder of Kamigamo Shrine in Kyoto led The Emperor Jinmu to conquer his enemies resided in eastern Japan in his disguise of a huge and wondrous raven and contributed a lot to its success. Sumo symbolizes this religious event, driving evil-spirits away from a sacred place. In fact, a sumo wrestler in disguise of Tone (warrior) holding a bow and arrow imitates raven cawing and afterward, boys used to play sumo. Whenever we have a festive, we are to hold sumo championship at the festive site. Originally, shape and largeness of dohyo had not been fixed. some were square and others round but in dual rounds. The largeness of dohyo was rather smaller than current one. Currently, it is regulated that it should be round in encircled with 20 small straw bags and 4.55 m in diameter while two shikiri(getting off the mark) of white color must be lined at 70 cm in between at the center of dohyo. Sumo was originated long before dating back to era of The Emperor Suinin in A.D.360 Since then until now, it has been loved by all layers of people; nobles, warriors, laymen of this country with slight modifications but the basic mode unchanged. Sumo is widely accepted in Shinto events, local festivals, amateur sports and ohsumo, and thus, it is really worthy to be called national game. It can also be developed to a further extent and prevailed overseas countries as well. Sumo , together with Judo and Kendo(Japanese fencing), became a compulsory subject of middle school athletics from the year 24th Heisei(A.D.2012). Therefore, we can expect an increasing number of students who select and practice sumo, thus building up a stout body with a polite and high moral. And sumo also became well-known even in foreign countries and those who love sumo are increasing to come to Japan to enjoy sumo bout firsthand. Origin of sumo is very old. Ancient age tomb depicts sumo-like scene. When we study sumo history, we find sumo is quite often told in myths. One of those myths told us that two gods called ”Takemikazuchi” and “Takeminakata” grabbed their arms each other and threw one another. Apart from those myths, the oldest sumo match done by human being was said the one between Nomino- Sukune and Tagimano-Kuehaya . In this match, Sukune kicked Kuehaya down to the earth. Kicking down is not allowed in contemporary sumo. Although this was totally different from existing sumo, Sukune, is anyhow, deemed as father of sumo. On July 7 of 7th year of The Emperor Suinin reign(A.D.360),Taimano -Kehaya of Tagimamura,Yamato bragged himself saying that no one throughout this country was stronger than him. Knowingly this rumor, The Emperor summoned his subjects to recommend any sumo wrestler to compete with the bragger. Accordingly, Nomino-Sukune from Izumo was recommended Then, the match was set. This was considered origin of sumo. However, this fight had, contrary to current sumo, been continued until an either became fatally defeated. Sukune got Kehaya's ribs broken, thus Kehaya was dead. With this win, Sukune was given Kuehaya's domain from The Emperor and he was allowed to serve The Emperor as one of the majesty's subjects. As his descendants became engaged in clay image firing works, the family was donated the name “ Haji” from the royal highness. The Haji family inclusive of Michizane Sugawara, then a most talented scholar and ,at the same time, influential government official became one of influential clans. 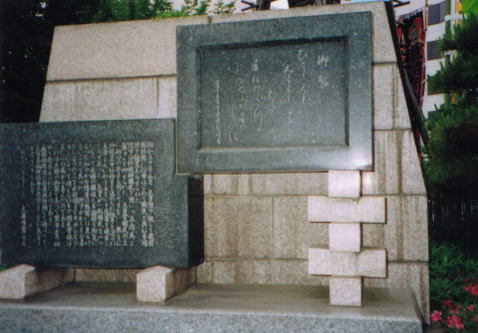 Because of this, we can notice Nomino-Sukune enshrined , together with Michizane Sugawara at same time at Tenjin Shrines which were especially built for Michizane . On the other hand, the eponymous shrines which Nomino-Sukune is enshrined as a god of sumo are available in Tatsuno city ,Hyogo and Sumida-ward, Tokyo . Furthermore, there are epitaphs and/or five roofed stone towers(built in early years of Kamakura era) praising Sukune’s achievement at 12 gods shrines in Sakurai city, Nara and Izumo, Shimane. The first reference to sumo was made by Nihon Shoki, the oldest book on Japanese mythological history, told us that The Emperor Kougoku, in his first year(A.D.642) ,made Kondei (young coteries)performed sumo in front of envoy from Kudara (then, ruled the whole of Korea) king's clan. In 3rd year of Jinki(A.D.726),The Emperor Seimu dispatched his imperial envoys to 21 shrines of his country inclusive of Ise Shrine and offered them sumo performance in order to appreciate the year's rich crop. On July 7 of 6th Tenpyou(A.D.734), TheEmperor Syomu summoned all sumo wrestlers from every corners of his country to gather at his court and make sumo matches reminding the first match of sumo between Nomino-Tsukune and Tagimano-Kuehaya on the very same day of some hundred years ago.＊Zoku Nihon-Ki=Second series of Japanese History＊。This was thought as origin of Tenran-Sumo(in auspice of the Emperor). This also indicates the beginning of the ceremony called “Sumaino-Sechie”. Age of Bushi(Warrior) On April 3 of 1st Bunji(A.D.1189),Yoritomo Minamoto, the first Kamakura Shogun( a general of Warriors'government)had inspected a sumo performance at Kamakura Hachiman Shrine. *Azuma Kagami* This is the first Shogun Joran Sumo. (Sumo performance in presence of Shogun). On October 15 of 1st Shoka (A.D.1257),Shogun Joran Sumo was done by Tokiyori Hojo ,*Azuma Kagami* During Muromachi Era (A.D.1392 to A.D.1573),Ashikaga Shoguns had often visited sumo performance. and during later of this age,some　sumo wrestlers became professional. On March 3 of 1st Genki(A.D.1570), Shogun Joran Sumo was done by Nobunaga Oda at Johrakuji Temple *Nobunagako Koki=Nabunaga Biography* On February 29 of 6th Tensho(A.D.1578), the same was done at Azuchi Castle. Even after the succumb of Nobunaga, it was succeeded by Hideyoshi Toyotomi and Hidetsugu, the son of Hideyoshi. In 5th Bunroku(A.D.1596), 10 pro-sumo wrestlers resided in Kansai made the first sumo tour in Chikugo, Kyushu. Edo era had started, and Kanjin Sumo became popular in Kyoto, Edo (now Tokyo) and Osaka. Kanjin Sumo was originally intended to contribute some profit to shrines or temples when they are newly built or repaired. Local pro- sumo wrestler groups used to join these activities. Gradually, even profit only professional sumo was also called “Kanjin Sumo” . This is because a special permission was necessitated from Bakufu (Edo Shognate Government)even for without- contribution sumo as well as Kanjin Sumo . Hirofumi Itoh, Aritimo Yamagata, Shigenobu Ohkuma,(They are all outstanding figures during Meiji Revolution). In April of 15th Genroku(A.D.1702), Kanjin Sumo held at Horie,Osaka which does not make any contribution to shrines or temples was first permitted by Bakufu . 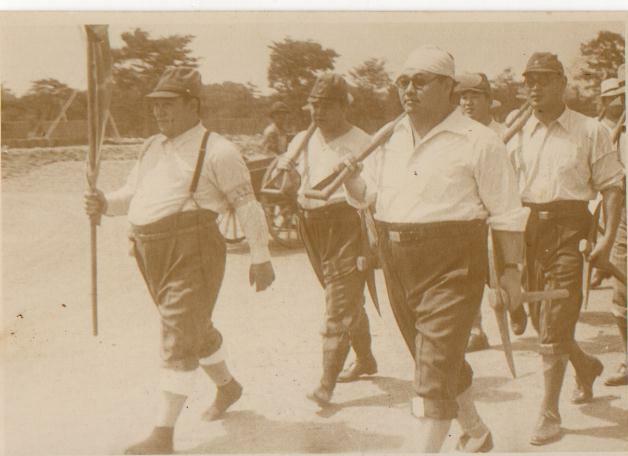 This Kanjin Sumo was further developed to current ozumo. During Kyoho Era(A.D.1716 to A.D.1735), sumo wrestlers ranking chart called “banzuke” had appeared in both Osaka and Kyoto. In 7th Horeki(A.D.1757), a vertically written banzuke was first issued in Tokyo. This indicated Edo became independent from Osaka and Kyoto, banzuke of which were horizontally written. In October of 11th Horeki(A.D.1761), the writing of Kanjin Sumo held at Kuramae Hachiman Shrine had been changed to Kanjin Ohsumo. 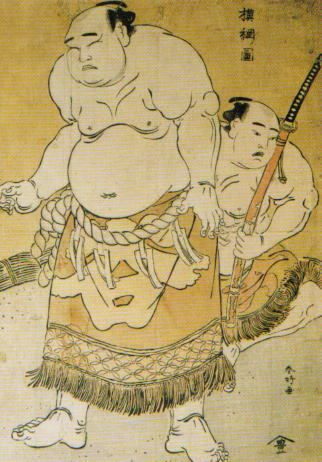 In November of 1st Kansei (A.D.1789),Yoshida-Tsukasa family gave a license for Yokozuna Dohyo-iri performance to Kisaburo Onogawa and Kajinosuke Tanikaze. This is said as a substantial foundation of current Yokozuna system. In June of 3rd Kansei(A.D.1791),Shogun Joran Sumo by Ienari Tokugawa, 11th Shogun of Edo Bakufu, was held at Edo Castle. Two strongmen of Kajinosuke Tanikaze and Kisaburo Onogawa fought and Tanikaze, the winner, was given a bow from the Shogun. Then, he danced raising arm up with a bow in hand and brandished it to the four corners of dohyo. This is the origin of current Yumi Torishiki. (Bow Receiving Ceremony). In 2nd Bunka(A.D.1805),the scuffle caused by Me-gumi(a fraction of fire-fighters in Edo) had the spring tournament of sumo cancelled. In October of 4th Tenpo(A.D.1833), Ekou-in , Honsjo, Edo was fixed as an official place for sumo. In April of 2nd Kaei (A.D.1849), Shogun Joran Sumo by Ieyoshi Tokugawa was held at Edo Castle. On June 3 of 6th Kaei (A.D.1853),Perry led a fleet of battleships to Uraga. This point is a　time of change in Japanese history. 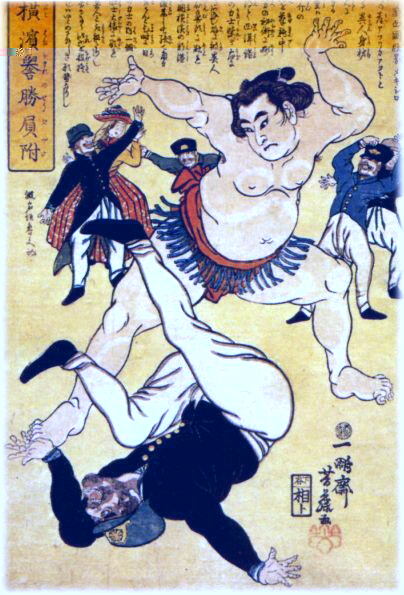 An Ukiyoe depicts a sumo wrestler throwing a crew of the fleet . End of Edo era. Thus, feudal lords had bankrupted. Sumo wrestlers who feudal lords employed became difficult to exist. After the Meiji Restoration On April 17 of 4th Keio (1st Meiji,A.D.1868),The Emperor Meiji had been presence at Kyoto sumo held at Zama Shrine,Osaka. In March of 2nd Meiji(A.D.1869),Osaka sumo abolished their banzuke of horizontally written of two(East/West) columns and unified to Edo style of vertical written of one. In June of same year, Daimyo’s domains had been abolished,. Consequently, their sumo wrestlers were unemployed. In March of 4th Meiji(A.D.1971), a joint sumo of triple cities(Kyoto, Osaka and Tokyo)had first been held in Kyoto. In August of same year, Meiji Restoration Government proclaimed Bobbed Hair Order, but mage(sumo wrestler hair style) became exceptional from this order . In January of 21st Meiji(A.D.1889), the letter of Juryo on banzuke sheet was written a little bolder than before. In January of 22nd Meiji(A.D.1890), Tokyo sumo had changed the nomination of Sumo Kaisho which had been used from Edo era to Tokyo Ohkakuteii Kyokai(ozumo kyoukai) . and limited the number of Toshiyori (retired sumo wrestlers who can stay at the association after retirement as they own certain amount of the share)to 88. In February of 42nd Meiji(A.D.1910), Tokyo ozumo Association added a stipulation clearly stating that nomination of Yokozuna should be limited to champion wrestlers only, not for the highest ranked wrestlers . In July of same year, both Tokyo and Osaka Ohsumo Associations, competing with each other so far, had dissolved themselves and made a sign to unify both associations into one. Tokyo had proposed Osaka that both ohsumo could compete with each other for the Emperor’s Cup which had before been given for Tokyo only. Thus, their face being saved, Osaka had accepted Tokyo’s proposal and agreed to be unified. On December 28, Ministry of Education/Culture had approved Dai-Nihon Sumo Kyoukai (Great Japan Sumo Wrestling Association), as a public corporate. In 15th Taisho(A.D. 1926), Tsunenohna, 31st Yokozuna, won the January basho and got the first Emperor’s Cup. In January of 2nd Showa(A.D.1927), both Tokyo and Osaka Sumo Associations had officially unified and named the unified Association as Great Japan Sumo Wrestling Association. 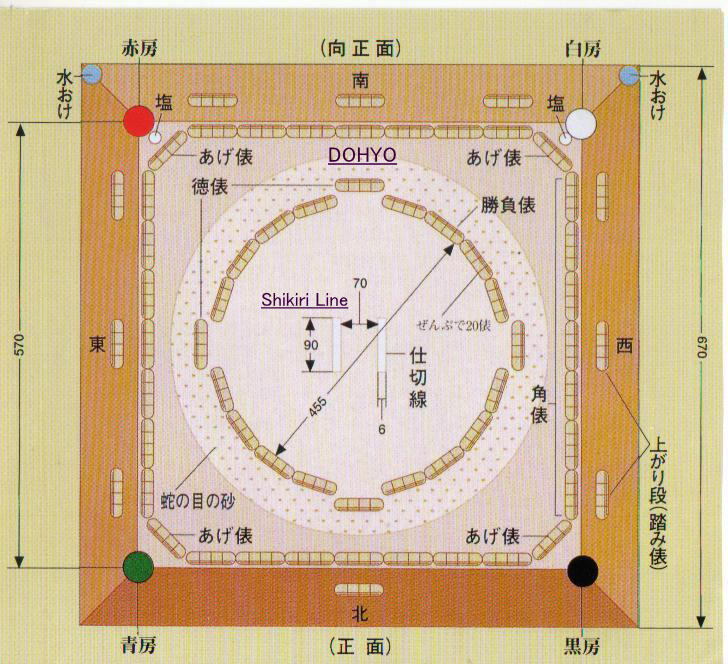 In January of 3rd Showa(A.D.1928), shikiri is regulated to be lined in the span of 60 cm in between both lines of white at the center of dohyo. Time limit for shikiri was also set up as being 10 minutes for makuuchi, 7 minutes for juryo and 5 minutes for makushita. In May of 5th Showa(A.D.1931), diameter of dohyo is also regulated as 15 shaku (4.95 m), and dually encircled straw bags into one. and the roof of dohyo to be constructed in Shinmei style. In January of 7th Showa (A.D. 1937), those sumo wrestlers of Dewanoumi faction ranked in west of banzuke besieged Shunju-en, Ohoi,Tokyo, appealing to renewal of sumo-do(How should sumo be). Some wrestlers ranked in east also joined this appeal, retiring from the association. This caused cancellation of the January basho. This was called as Shunju-en Incident. In 12th Showa(A.D.1937), Dai-Kokugikan (national sumo pavilion) was completed at Sekime, Joto-ward, Osaka and pre -Osaka basho was held on both days of June 12 & 13. In May of 14th Showa (A.D.1939), sumo basho of 15 days started. Ryogoku Kokugikan had been taken over by military. And some sumo wrestlers had been called for a military training. In May of same year, 10 days sumo when not rainy, was held at Korakuen Stadium. In November, same was done at same place. In March of 20th Showa(A.D.1945), by US air-strike, Ryogoku Kokugikan was damaged. In June of same year, 7 days sumo was held at damaged Kokugikan without any announcement. In August of same year, the war had ended . In November of 20th Showa(A.D.1945), first postwar hon-basho(regular tournament of ohsumo) of 10 days was held at the damaged Ryogoku Kokugikan. In December of same year, US occupation HQ had taken over Kokugikan. In 21st Showa(A.D.1946), hon-basho(summer) had been cancelled since repairmen of the damaged Kokugikan had largely been delayed. In June o 22nd Showa(A.D. 1947), natsu(summer)-basho of 10 days when not rainy was held at Meiji-Jingu-Gaien. In November of same year, aki(autumn)-basho of 10 days when not rainy was held at the same place. 3 awards of most valuable prize, fighting spirit prize and technically excellent prize were established from this basho. In May of 23rd Showa(A.D.1948), natsu-basho of 11 days when not rainy was held at Meiji-Jingu-Gaien. In October of same year, hon-basho of 11 days was held at Osaka temporary Kokugikan. In January of 24th Showa(A.D.1949), hon-basho of 13 days was held at Hamacho temporary Kokugikan. 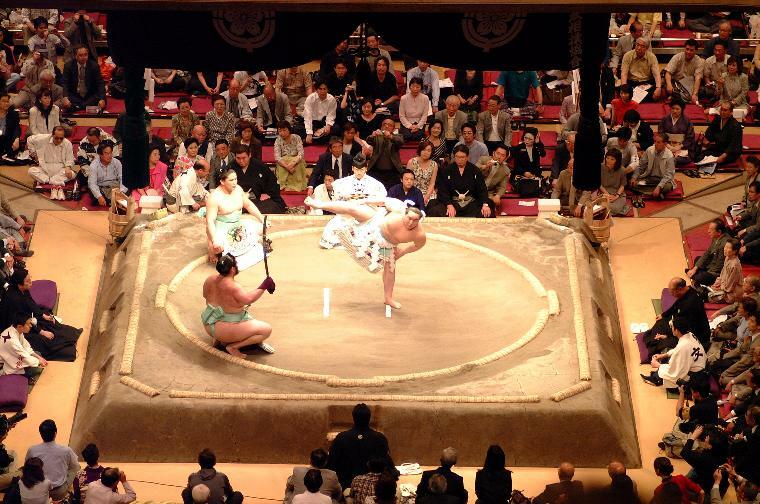 In May of the same year, natsu-basho of 15 days was held at Hamacho temporary Kokugikan. On October 23 of the same year, Ozeki Chiyonoyama (Dewanoumi ) became champion at record of 13-2. In January of 25th Showa(1950), 15 days ohsumo was held at temporary Kokugikan set up at Kuramae, Tokyo. 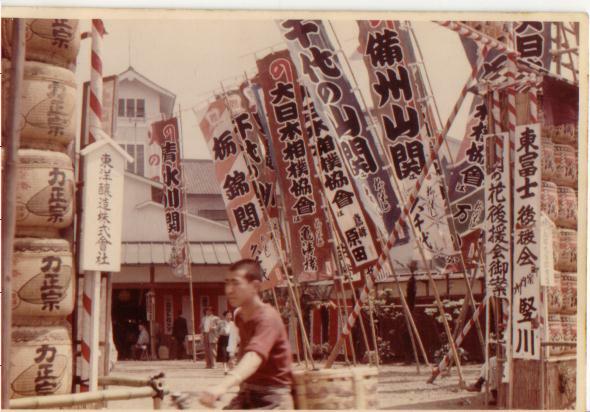 Kuramae where matches were always heated and people were so excited had repeatedly been repaired but no roof on it. In January of 60th Showa(A.D.1985),new Kokugikan had been completed at Ryogoku, Tokyo but in order to keep the atmosphere, roof had not been set up there. In July of 27th Showa(A.D.1952), rikishi-nobori(sumo wrestler banner) had been hoisted since 43 years when done at Ekoin, Honjo, Tokyo of 42nd Meiji(A.D. 1910). In September of the same year, pillars had been withdrawn from the four corners of dohyo and instead, four colored tassels were hung from suspended roof . These four colored tassels of blue, red, white and black are such talisman as protecting each of four corner s of dohyo, namely east, south, west and north in order. It also means four seasons of spring, summer, autumn and winter. In January of 28thShowa(A.D.1953), it was decided that hon-basho would regularly beheld at 4 throughout the year as spring ?basho at Osaka while summer, autumn and winter at Tokyo.In September of 29th Showa(1954), Kuramae Kokugikan was completely repaired, and natsu-basho was held there. In January of 32nd Showa(A.D.1957), it was decided to add one more sumo tournament in November at Kyushu to said four basho. Thus, hon ?basho became 5. In January of 33rd Showa(A.D.1958), it was also decided to add one more in July at Nagoya, Thus hon-basho became 6 in total. In January of the same year, Dai Nihon Sumo Kyokai had been altered to Nihon Sumo Kyokai(Japan Sumo Wrestling Association). The 2nd chapter of the corporate stipulation says that they intend a healthy growth of sumo-do and contribute to the public for their physical or spiritual betterment. In March of the same year, Wakanohana, the 45th Yokozuna ,inaugurated. Since then, a boom of Tochi (Tochinishiki, powerful Yokozuna opponent of Wakanohana)vs Waka Age had come. In due course of TV prevailing throughout this country of this age, another good matches such as Taiho vsKashiwado Age, Kitanoumi vs Takanohana Age, Chiyonofuji hegemony became booming successively. In January of 43rd Showa(A.D.1968), Prime Minister Award was newly established. In May of 45th Showa(A.D.1970), span of both shikiri lines was extended to 70 cm from 60 cm. On October 4 of 59th Showa(A.D. 1984), Kuramae Kokugikan had been closed. In January of 60th Showa(A.D.1985), Ryogoku Kokugikan had newly been opened. In January of 7th Heisei(A.D.1995), Takanohana, the 65th Yokozuna, inaugurated. In July of 10th Heisei(A.D.1998), Wakanohana, the 66th Yokozuna, inaugurayed. Waka-Taka age had started. In January of 13th Heisei(A.D.2001), number of trick was officially limited to 82. Physical check for recruiting sumo wrestler newly was revised as; 173 m minimum for height and 75 kg minimum for weight for first pass and for those who could not reach minimum required in the first pass can get another test of their physical ability if they are higher than 167 cm and heavier than 67 kg. There was also a revision in makushita ranking system; according to outcome of amateur sumo, the can be classified into makushita 10th to 15th grade. In March of 15th Heisei(A.D.2003), Asashoryu, the 68th Yokozuna, inaugurated. Local sumo tour was changed from a volunteering of Japan Sumo Wrestling Association to sold-out to each local impresario. In January of 16th Heisei(A.D.2004), official injury rule was abolished. Activity of foreign sumo wrestlers became outstanding in upper ranks. In December of 17th Heisei(A.D.2005), Japan Sumo Wrestling Association cerebrated the 80th birth since its corporate In 19th Heisei(A.D.2007), May tournament counted a record high18 foreign sumo wrestlers . In July of the same year, Nagoya-basho cerebrated 50th birth since its debut. In September of 20th Heisei(A.D.2008), the Association had first called in council member from outer circle. In January of 22nd Heisei(A.D.2010), Asashoryu, Yokozuna fromMongol ,the3rd ranked championship winner of 25 times in sumo history, had to quit himself from ohsumo because of lack of Yokozuna decency qualification. On October 10th of the same year, Sumainosechie as a national ceremony of July 7 in presence of then Emperor had reappeared at Heijokyo site of Nara city when they cerebrated 1300th years since transfer of their capitol to Heijokyo in Nara. There,10 amateur sumo wrestlers performed it waiting for the emperor’s judgment for ambiguous match as thought so in Sumainosechie. In March of 23rd Heisei(A.D.2011), the March tournament had been cancelled. Cancellation of hon basho is only twice in ohsumo history . Another one is natsu-basho of 21st Showa for delay of repairmen of bombarded Kokugikan . In April of the same year, hon-basho of May had been held free without admission fee as titled as a checking basho of sumo wrestlers technicality. In July of the same year, ohsumo had been normalized, holding July tournament. In January of 24th Heisei(A.D.2012), Kitanoumi was elected as 12th director general of the association.